Over the next several months, Sarah and I (and maybe Saundra) will write several blogs devoted to services and products we offer that will appeal to those of you who may think that we cater exclusively to professional photographers, artists, and business customers. The truth is we have never turned away consumer business; in fact, we enjoy serving individuals who just want excellent pictures printed by someone whose next task isn’t restocking diapers on Aisle 4. Our former Five Points lab was a destination location, a bit off the beaten path, and our zoning with the city didn’t allow for retail operations. With our move to 3119 Beach Boulevard last year, that all changed. With Curry Thomas Hardware right across the parking lot and the Mudville Grille just down the sidewalk, everyday folks walk past our windows all the time, and guess what? Unlike Lomax Street, most probably don’t have a problem finding a parking place. Saundra and I are baby-boomers, and as such we have lived in both the analog and digital world. My mom, who’s 84, never really made the digital transition (except for recording soap operas on her DVR). She’s our only surviving parent, and after several recent extended stays in hospitals and rehab facilities, we have made a conscious effort to spend time with her and try to put our family history in order. Some of you have similar issues, and sadly, some of your parents may have already passed, leaving you with the task of sorting out the family images by yourself. Most of us have relatives who can help with genealogy, but it isn’t practical to send them boxes and boxes of photos… but what if those images were in a digital format? Since we own a lab, we jumped on the scanning bandwagon, but it wasn’t until we started scanning images for the Jacksonville Historical Society that we developed a passion for preserving history. We started scanning and archiving our important family images years ago, but many of you don’t have that resource. Aha, maybe he’s finally getting to the point. 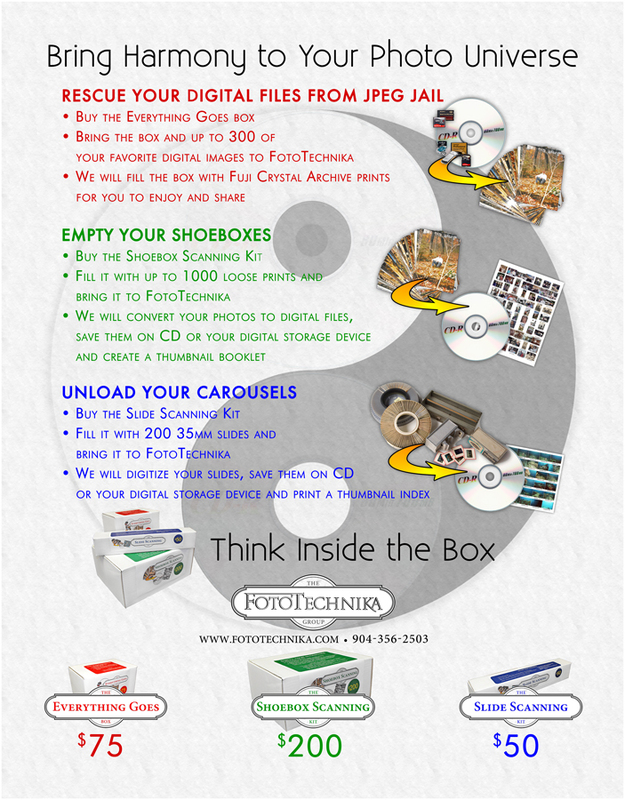 At FotoTechnika, we have quite an array of scanning devices. 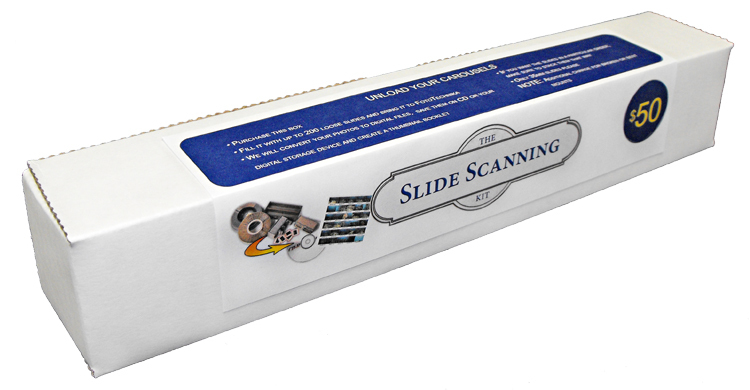 We don’t only do the high-resolution scans for those great big art prints and photos; we also have scanners that specialize in handling volumes of prints, slides and film. We know that quite a few of you have rather large family collections. Some may be in excellent condition, but I’m sure anyone as old or older than me has some photos or film that are changing color. It’s time to scan those images before they fade more, but it has always been so darn expensive. Well, we want to help you by offering several deals that can save you money and at the same time let you do a little of the organizing that so often falls to us. We’re thinking outside the box encouraging you to THINK INSIDE THE BOX. 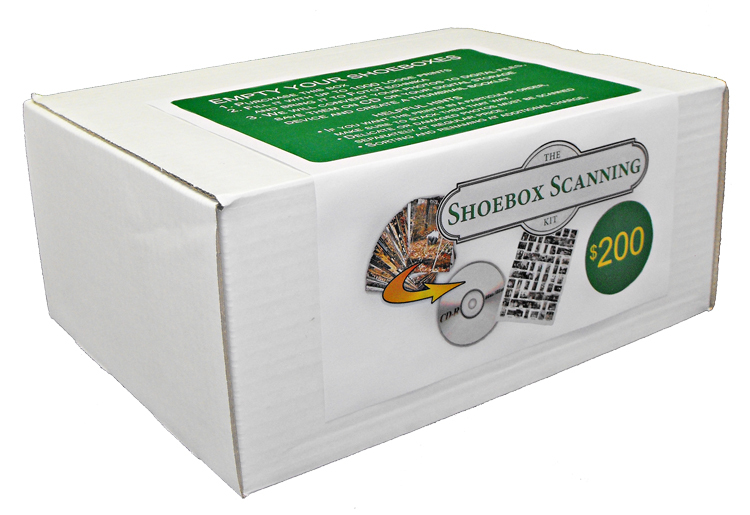 We will sell you a Shoebox Kit for $200. You fill the box with up to 1000 prints, from wallets to 8x10s. We will scan those prints and create 300-dpi jpeg files capable of producing prints the same size as the original photographs. We can save the images to a CD or to your USB thumb drive or external drive, and we will create an 8.5×11 booklet with thumbnails of the images. All you do is put the photos in the box. The prints do need to be flexible enough to bend easily, and if you want them in a certain order you need to stack them accordingly. PLEASE, no badly torn photos or ones that have sticky stuff on them, unless you want us to scan those separately for an additional charge. In both cases, you help us by sorting your images into the boxes we provide. Sure, we can scan from your scrapbooks or pull slides out of carousels, but then we are doing a lot of the sorting. 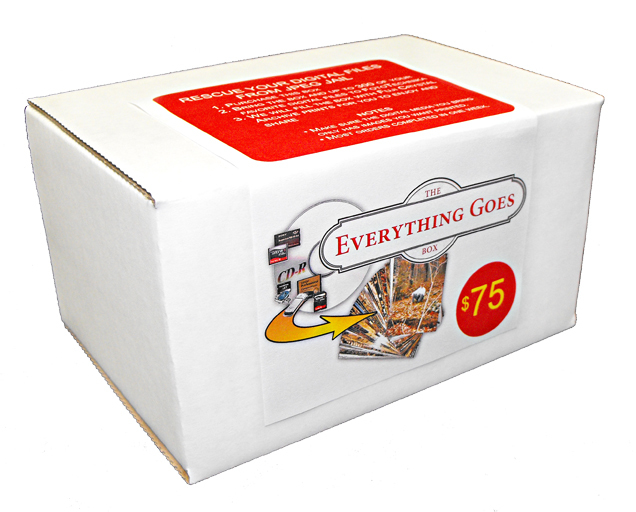 When you put the slides or prints in boxes, you are rewarded with volume pricing. It works out to be $0.25 per slide and $0.20 per print – all scanned with the TLC FotoTechnika is famous for. AND… for those of you who have already gone totally digital, we have made a box for you, too, just so you won’t feel left out. If you haven’t already figured it out, hard drives and smart phones crash – shoeboxes don’t! So you need to think about printing your more important files. These boxes make perfect Mother’s Day, Father’s Day, and graduation gifts, so get them now, and let us help you preserve those family treasures.